The Bat Centre trust is a private trust dedicated to impacting on the cultural life of South Africa by nurturing and promoting the vibrant music, arts, theatre, craft, film and literature of KwaZulu-Natal. In so doing, the Bat Centre aims to generate work for artists, build new markets for domestic and international tourists to Durban and its innovative and exciting facility situated in the Durban Harbour. 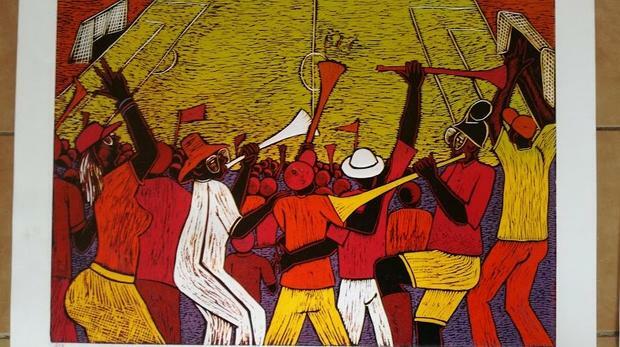 The Bat Centre is celebrating the life and success of the late Ezequiel Moiane (1974-2012) famously known as Isaac Sithole by hosting a traveling retrospective exhibition featuring a special collection of Sithole's work. Born and raised in Maputo, Mozambique, Isaac was introduced to the traditional technique of woodcarving by friends in his neighbourhood when he was 12 years old. In 1990, at the age of 16, he moved to South Africa with a friend. Shortly after moving to Durban, he joined the Bat Centre where he worked as a professional, full-time woodcarver getting exposed to the technique of woodcut printing. Sithole's work is filled with glowing and vibrant colour combinations depending daily scenes and cultural activities within Mozambique and South African villages. He was inspired by the beauty in the ordinary, to transform the spirit of the living into art. The planned exhibition commemorates Sithole's legacy of hard-work and self- sustainability in the local art industry and communities. The exhibition was launched at the BAT Centre in February 2018.